It was 20 years ago this month that our late founder UN Secretary-General Kofi Annan first proposed the idea of a Global Compact between the United Nations and the world’s businesses. The universal principles on human and labour rights, respect for the environment and anti-corruption proposed by Kofi Annan as the basis of our relationship are as valuable and relevant today as they were then. During the year gone by, many of us have felt the foundations of our world shifting beneath our feet. We have wondered if the excesses and abuses of decades past could return to rip apart the stability we considered our bedrock. We have seen facts challenged by absurd rhetoric and twisted logic. A small group of individuals are getting exponentially richer as billions are left behind in poverty, millions of desperate people are leaving their homes risking everything for a better life elsewhere, xenophobia is making a comeback and climate change threatens our very survival. In a topsy-turvy world, our Ten Principles can help restore our balance and steady our nerves. Three years into the Sustainable Development Goals (SDGs), good progress is happening on many fronts such as alleviating poverty and bringing down child mortality. But there are huge gaps particularly on climate change and inequality — for women, young people and for workers in the global supply chain. This is where business can make a huge difference. So now is the moment in time when we can together begin to create the tipping points that can drive a more sustainable way of life as envisioned in the 2030 Agenda for Sustainable Development and measured by the SDGs. While many business initiatives towards the 17 Global Goals have been encouraging, we urgently need more companies to get involved. We need to scale up faster and we need to reach tipping points that will turn corporate sustainability from a nice idea into a practical, mainstream reality for businesses everywhere. The 2030 Agenda requires big and small companies alike to lead the charge towards a more sustainable future, including the investment community who can help steer the US$3 to US$5 trillion dollars needed annually to achieve the SDGs. Achieving the SDGs by 2030 may be a tall challenge, but it is one that we must achieve for our own sake and for future generations. Getting there will require a deep transformation throughout society — starting with each of us as individual leaders. For my part, as leader of the UN Global Compact, I am pleased to see our 70 Local Networks creating awareness and catalyzing action on the ground. They provide our participants with the connections and expertise required to drive sustainability at the national and local level and are truly “Making Global Goals Local Business.” More than 80% of our participants say they are actively engaged in achieving the SDGs and, in more than two-thirds of our companies, the CEO is driving the Global Goals as part of a responsible business innovation agenda. My colleagues and I are striving to equip all our participants with the necessary tools and resources to pursue corporate responsibility in their own way. A few examples include our new learning platform, the UN Global Compact Academy, our new SDG Reporting framework to help companies account for their progress towards the Goals and Ten Principles, and our Action Platforms that have been designed to enable businesses to innovate towards the Goals through our unique principles-based approach. 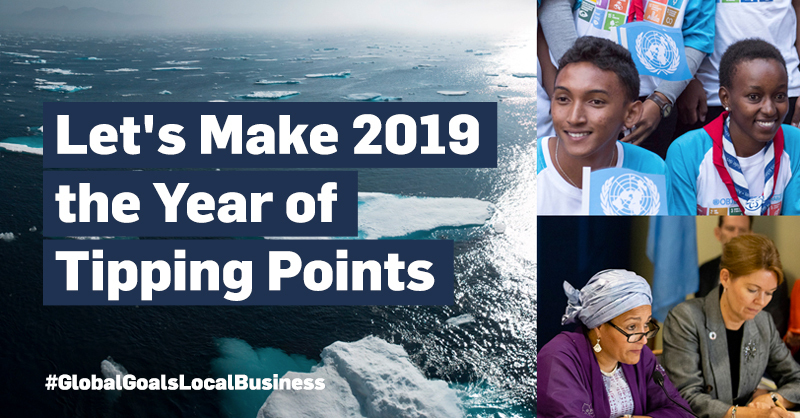 This year, we will be launching three new global impact initiatives to help stakeholders to drive tipping points and real world impact by: Driving the SDGs through Youth and Innovation, Closing the Climate Change Gap and Closing the Gender Empowerment Gap. Through your leadership, I encourage you to continue your efforts to demonstrate that business is a true force for good. Whatever the world throws our way, let’s navigate towards the SDGs — always guided by our Ten Principles. As Kofi Annan stated 20 years ago, and UN Secretary-General António Guterres continues to advocate today, Governments cannot do it alone. The transformational change to create a better world relies on business know-how and resources. In other words, leaders like you. Thank you for being part of the UN Global Compact. We look forward to working with you in the coming year, the Year of Tipping Points.